Mobile devices such as tablets and smart phones are improving productivity, collaboration and efficiency, but their rapid growth also presents serious security risks to organisations. If a mobile device is stolen, hacked or lost, there is a risk that sensitive data will be lost as well. And the threats are not only confined to data loss. Malware in the form of Trojans, viruses and worms and unauthorised network access attacks are also growing risks. How can you reduce these risks? Are security technologies and services keeping up with the changes in the mobile IT environment? Which are most effective? 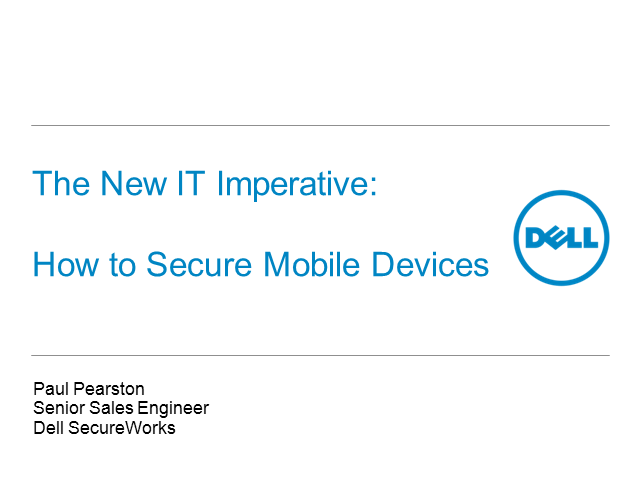 Paul Pearston, a Senior Security Engineer at Dell SecureWorks, will discuss the most serious security threats to mobile devices and will recommend specific approaches for securing the mobile organisation during this 30-minute complimentary webcast. Paul is a highly experienced Security Architect with over fifteen years’ experience designing, implementing and auditing all forms of security solutions and services ranging from identity and access management through to governance, risk and compliance. The design and delivery of network security controls and event monitoring solutions for large scale environments is an area Paul has considerable expertise in. Paul is Cisco CCIE (Security), CESG Listed Advisor (CLAS) and PCI QSA certified.